However, the D.C. landmark isn't shrinking. Rather, its new "base-to-tip" height uses international measurement standards and technology not previously available and, for the first time, meets modern international standards for building heights. New international measurement standards and technology previously not available helped determine that the Washington Monument is about 10 inches shorter than what has been recorded for the last 130 years. The new measurements were calculated by the National Oceanic and Atmospheric Administration's National Geodetic Survey. NGS provides the framework for all positioning activities in the nation. The measurement was made using measuring certification standards of the Council of Tall Buildings and Urban Habitat and was finalized in December 2014. The new height is a "highly precise" measurement that makes it eligible for inclusion in the official registers of the world's tallest structures, which is maintained by the CTBUH, according to NOAA. The historical height was 555 feet and 5 1/8 inches, but neither the starting point nor the "standard deviation" of the 1884 measurement is known, making it difficult to compare the two measurements, NOAA said. "We have to be cautious in comparing this new height to the historic one, since we do not know precisely the actual starting point that U.S. Army Corps of Engineers Lt. Col. Thomas Casey used in 1884," said Dru Smith, Ph.D., NOAA's chief geodesist. The original height may have come from four markers, nicknamed "the Casey markers," located in the ground a few feet off each of the Monument's corners. The latest survey also measured the height from those marks, and the result matched the original height within 3/4 of an inch. 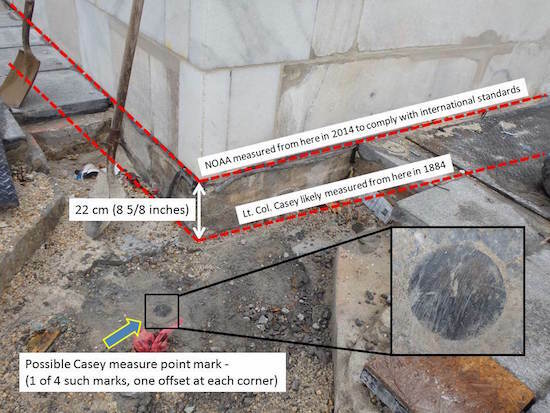 However, NOAA cautioned, "There remains ... no historical evidence in anything Casey reported that he did indeed use those corner marks as his zero height point." The new height is accurate to within plus or minus one millimeter, and that variation is now the known standard deviation, according to NOAA. This illustration shows the possible measuring points used by Lt. Col. Thomas Casey in 1884 and the 2014 measuring point used by NOAA to meet CTBUH standards. 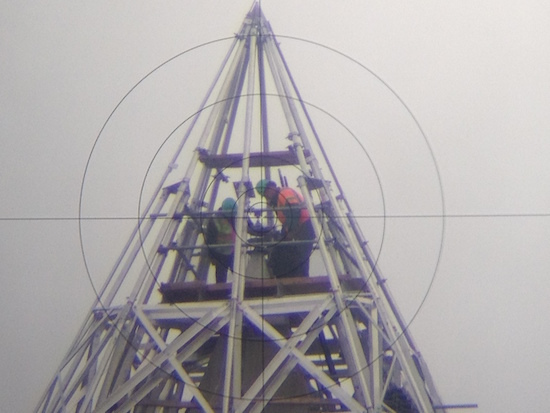 The modern standard for measuring the Monument's architectural height refers to the height up to the tip measured from the actual floor point within the Monument itself, not to a point or points below the ground around the building. "No measurements are perfect. What is important to know is how well that measurement has been made—the standard deviation. We do not know the standard deviation used in the original estimate of 555 feet 5 1/8 inches, nor do we know the actual starting point for the measurement," Smith said. "It is the reference to an eighth of an inch that makes the original measurement so interesting. "Did the original builders think they had truly measured or estimated the height with sufficient accuracy to justify that last eighth of an inch? The answer is unclear and at present remains lost in history. "What we can now say with certainty is that the current height can be definitely stated to be within the standard deviation." When a rare 5.8-magnitude earthquake struck 84 miles southwest of Washington, D.C., on Aug. 23, 2011, it provided the opportunity to survey the structure. Damage to the Monument rendered it closed, and, with repair scaffolding in place in 2012, NOAA and the NPS worked together to update the position of the structure's peak and determine the architectural height of the building. The 2013-14 survey and architectural height is the end result of a request from the NPS to determine if the earthquake caused any unexpected settling of the Monument. "Did the original builders think they had truly measured or estimated the height with sufficient accuracy to justify that last eighth of an inch? The answer is unclear and at present remains lost in history," said Dru Smith, Ph.D., NOAA's chief geodesist. Based on a post-earthquake leveling survey done in 2012, NGS determined the earthquake "had no discernible impact on the settlement of the Washington Monument." During the same survey, NGS used multiple measurements taken since 1901 and found the structure settles at two-hundredths of an inch per year. Therefore, it has settled just under 2 1/4 inches since 1901, none of which is attributable to the earthquake, NOAA said. The new height provides documentation so that future measurements can be easily compared to determine if the height of the monument is changing in any way. The final results were reported to the National Park Service and made available online Tuesday (Feb. 17). 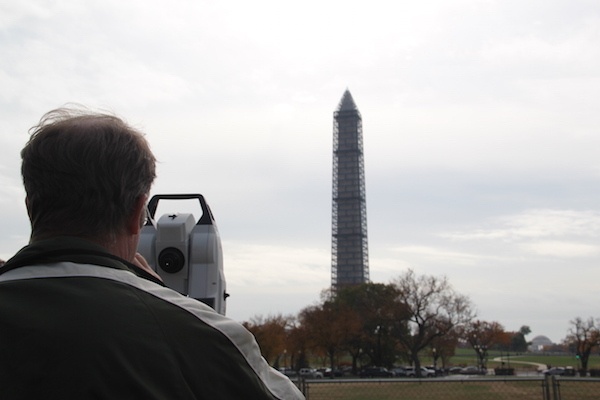 "The National Park Service appreciates the results of our continued partnership with NOAA's National Geodetic Survey and look forward to fully evaluating the report's findings of the architectural height of the Washington Monument," said Karen Cucurullo, NPS acting superintendent of National Mall and Memorial Parks. "The data from collaborative projects such as this provide us additional tools with which to track changes and plan appropriate measures for the long-term preservation of the monument," Cucurullo said.